At first sight it attracts for its gently pink colour, obtained by the expert use of wild red fruits collected in the undergrowth of the Apennines which the Italian writer, poet and screenwriter Tonino Guerra in his works considered as forgotten. It is the ‘Amarcord Riserva Speciale’, the beer which, as the other ones produced by ‘Amarcord’, the historic brewery in Rimini, was inspired by the famous film by Federico Fellini for which the Italian director also won an Academy Award along with Tonino Guerra. Amarcord, born in the second half of the ‘90s, soon attracted attention for the contribution it gave to the rebirth of Italian quality beer, so that it began to be appreciated again by international esteemers and be welcomed not only in the most prestigious places in North America, but also in the United Kingdom, Russia, Spain, France, Denmark, Hong Kong, and South Korea. Roberto Bagli, chairman of the board of directors of Amarcord, explains: «This diffusion has been obtained thanks to our participation in trade fairs and events attended by experts who are able to recognize quality, and who later got in touch with us by launching new sales channels». Roberto Bagli explains his business strategy: «In the world, Italian restaurants have proliferated. In these places, we intend to propose our beers as an alternative to wine, suggesting the most suitable gastronomic combinations». 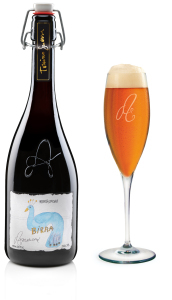 The ‘Riserva Speciale’ beer is prepared with malted barley, hops, acacia and wildflower honey, with the addition of sour cherry (wild cherry) and blackthorn (a spontaneous fruit which grows among mountain vegetation). It ages for nine months in the bottles, along with the yeasts used for producing champagne before being distributed. This way, it acquires elegance, consisting in an intriguing aromatic bouquet as well as a fine and gently dry taste, so that it can be consumed as an aperitif or alongside with medium aged Pecorino cheese, pâté, courses prepared with duck, pig or rabbit, but also in unusual combinations with oysters and slices of tasty grilled fish, such as tuna or swordfish. The Riserva Speciale is enclosed in a precious bottle with a sinuous outline, as the female protagonists of many films by Fellini. This bottle has been realized by Garrett Oliver, a well-known brewmaster of the Brooklyn Brewery in New York. After being fascinated by the classic labels produced by Amarcord, Garrett Oliver studied his new recipe, sealing a partnership with the Italian brewery thanks to which the presence in the United States was enhanced. The president of Amarcord adds: «For our beers, we claim a far superior quality level in comparison with the one of industrial beers. We use only top-notch ingredients, from malts to the different types of hops and yeast, by virtue of the adopted styles and never using concentrates and extracts, typical of standardized production». For preparing its beers, Amarcord draw the pure water they need from a source close to Apecchio, in the Apennines, between Marche, Umbria and Emilia Romagna. The ‘Riserva Speciale’ enriched the classic range of Amarcord beers, the four labels which distinguish the half-litre bottles with mechanical stopper (‘swing top’) dedicated to as many characters in the mythical film of Fellini permeated with dreamlike visions: Gradisca, Midòna, Volpina, and Tabachéra. ‘Gradisca’, a special lager (5.2% alcohol), is the only lager beer produced by Amarcord thanks to a major investment which allowed dealing with low fermentation. This process allows producing lighter and easy to drink beers, but it requires higher production costs in comparison with ale beers. In ‘Amarcord’ (in Italian ‘mi ricordo’ - in English ‘I remember’), Gradisca is the main actress, unattainable and dreamed by everyone: «She is elusive, but with simple and elegant manners. She was the ideal character to whom we could devote a beer suitable for any occasion», says Bagli, who recommends it as an aperitif or combined with not too important courses, such as pizza, grilled vegetables, or savoury pies. Its colour is bright golden, with a fine hoppy aroma, while its taste is dry and refreshing. Midòna, a belgian pale ale with dry hopping (6.5% alcohol), represents the feminine beauty of '40s, with bold character. In the glass, from which it releases an intense aroma of malted barley and hops, an old gold colour shines. Its body is round, full, so that it can deal without fear with fries, first courses with sauces prepared with vegetables, and grilled white meats. Volpina is an amber ale (6.5% alcohol) dedicated to the most picturesque figure of Fellini's masterpiece. 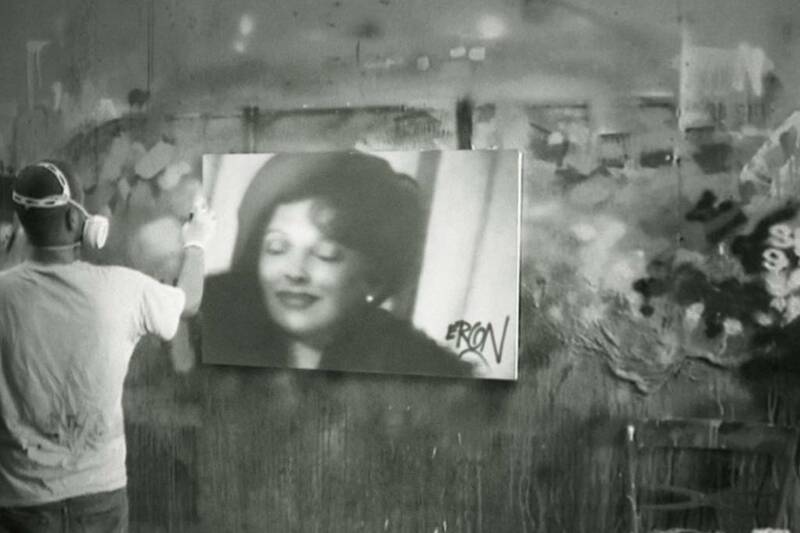 Bagli continues: «She is a taboo, a forbidden dream. With Volpina, the consumer sips a red beer with a strong character, ruby reflections, rich in spicy flavours which envelop palate and win it with an unforgettable ending». It is excellent with elaborate dishes, red meats, roasts, and average seasoning cheeses, soft ones, too, such as Brie and Camembert. The irrepressible Tabachéra, an amber double malt beer (9.0% alcohol) closes the quartet of beers inspired by Fellini’s films, in which this figure characterized by her enormous breast, evocative of strong sensations, emerges. And so it is with this label characterized by fullness of taste and smell, dominated by notes of honey and a rich taste of ripe fruit which develops in the mouth, reminding hazelnut. Its body, too, is structured, anything but anonymous, with fullness able to deal with elaborate first courses, aged cheeses, red meats, stews, and game. 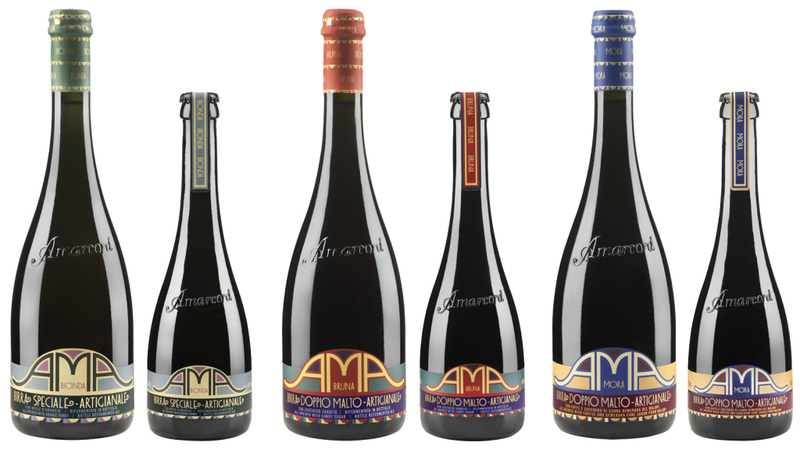 The series of beers ‘AMA cuore di birra Amarcord’, too, Bionda, Bruna and Mora are the result of a collaboration with Garrett Oliver. All these three beers are high fermentation ones and show a valuable appearance, born from the inspiration by a master of contemporary graphic design, Milton Glaser, who in the ‘70s of the twentieth century created the famous logo ‘IloveNY’. Both the Bionda and the Bruna are bottle refermented. The ‘Bionda’ (6% alcohol), characterized by a bright golden colour, boasts among its ingredients three different types of hops and orange honey of Sicily. It is recommended with seafood and it is excellent with ‘pasta al pesto’, too. 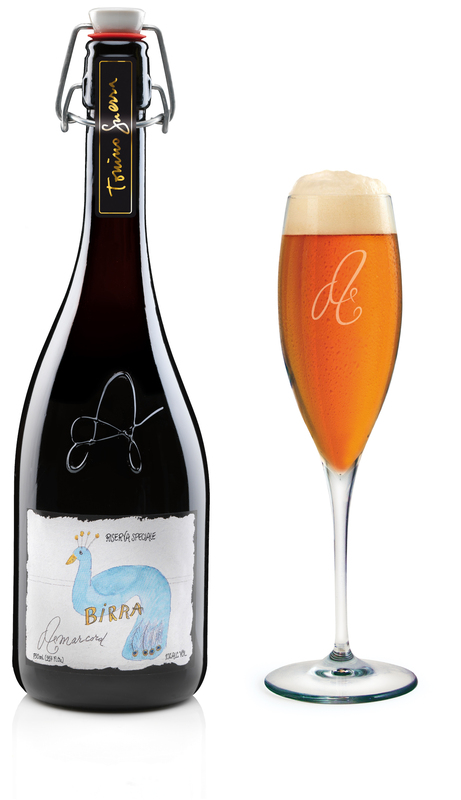 The ‘Bruna’ (7.5% alcohol), which reflects the style of abbey beers, is a double malt beer with candied sugar. Its flavour is complex, soft, and reminds chocolate and pear with cinnamon. Among the most suitable combinations there are the ones with baked lasagne, grilled red meat, or roast with gravy, and also such important desserts as apple strudel. A hypothetical vertical tasting based on alcohol content is closed by the ‘Mora’ (9 %), a double malt beer prepared with a selected blend of coffee and cane sugar from Malawi. It is structured and with elegant body, clean flavour, with hints of hazelnut and Italian espresso. It is especially recommended with spicy meat courses characterized by strong taste, such as game, wild boar, and braised meat, but also such desserts with mascarpone as 'tiramisù' and red fruit tarts.